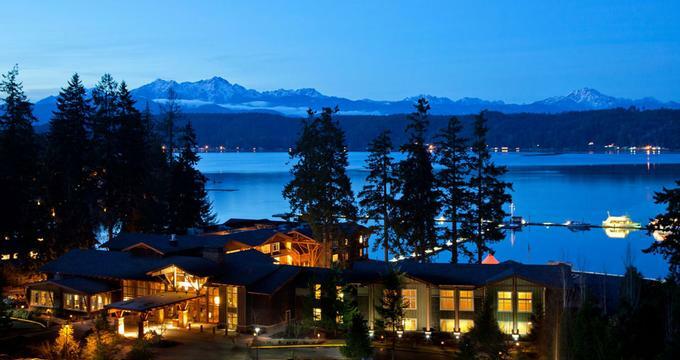 Resting on the shores of Hood Canal in Union, Washington is Alderbrook Resort, a place with picturesque views of the Olympic Mountains. Located between Portland and Seattle, WA, it is known to be a place where great memories are made. Being surrounded by the Olympic Mountains, guests who go to this resort get to live in a glacier-carved fjord where eagles, osprey, seals and salmon thrive. Meanwhile, those who opt to stay in this magnificent destination get to do so in the resort’s luxury guest rooms equipped with all the luxuries of a modern home, like comfortable duvets, daybeds, premium linens and soaking tubs. They have a world-class spa, a nearby PGA golf course and some of the best local cuisine coupled with world-class wines. It makes for a healthy mix of the beauty of nature and the comforts of modern living – the perfect getaway for those who want to escape the hustle and bustle of everyday life. Being close to the marina, guests who own boats can also bring them over for their own brand of relaxation. Alderbrook Resort has changed hands many times since it first opened in 1913, but its legacy has remained as a resort destination that’s unique to the Pacific Northwest. Back then, visitors would get to the resort by boat to sleep in tents nearby the creek where they kept their milk and butter cold. Some redesigning and rebuilding has turned this destination into a place that’s become ideal for all kinds of rest and relaxation. The cottages and lodges have all been remodelled and there is now a swimming pool and whirlpool fronting the canal. The stream has been revitalized through proper landscaping to make it habitable by salmon. 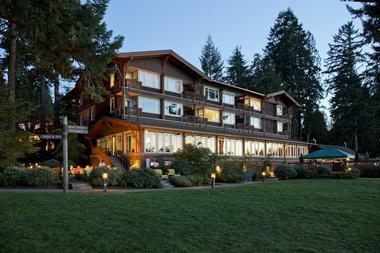 Through the years Alderbrook Resort and Spa continues to be an icon of the Northwest. Here, people can relax as they breathe in the scent of cedar with eagles soaring over their heads as they enjoy the taste of ice-cold milk during the summer. Alderbrook Resort has a long list of luxurious guest rooms and accommodation types, but they’re all designed to give guests a healthy mix of the natural beauty of the Northwest and the comforts of a modern home. Every room has luxury linens, soaking tubs, 32” HD TV, high speed Internet access and complimentary coffee and tea. Some guest rooms are pet friendly as well. The resort also gives its guests complimentary self or valet parking options. The largest among the guest rooms is the 425 square foot Parlour View Suite with French doors, deep soaking tub, TV, desk and other amenities. It’s great for those looking for a honeymoon getaway or an extended stay. They are available on the 2nd and 3rd floors. On the 3rd and 4th floors, just above the restaurant, are the 350 square foot Waterfront Guest Rooms which have panoramic views of the Hood Canal. They have private balconies with seating, window seats, deep soaking tubs and a chaise lounge. Guests can choose between a king, queen and even corner-view beds. For those who want a room overlooking the Olympic Mountain Range and Hood Canal, they can get the Canal View Guest Rooms on the lobby or the 3rd floor. These 350 square foot rooms are handicap accessible, featuring showers in lieu of soaking tubs as well as larger balconies. The Courtyard Guest Room is 350 square feet in area and is found on the lobby. They are built to be pet-friendly with easy access to the waterfront courtyard. As such, they are quite close to the pool, fitness centre, spa and many of the conference rooms. Overlooking the waterfall and courtyard are the Garden View Guest Rooms on the 3rd and 4th floors. 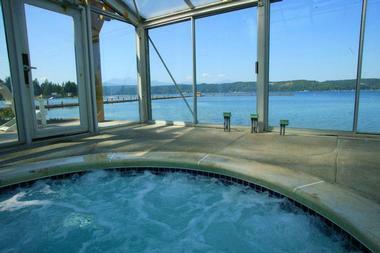 They also have a private balcony with seating as well as a partial view of the Hood Canal. These rooms are close to the restaurant as well. The last of the room types are the Creek View Guest Rooms on the 3rd and 4th floors. They give access to the plaza courtyard and have views overlooking the creek that leads to the Hood Canal. They come with one or two queen beds and are designed to be handicap accessible. In addition to the diverse guest room options, families and groups can opt for Cottage Rentals. Alderbrook Resort and Spa has 15 two-bedroom cottages and one single-bedroom cottage that feel like a private beach house. The cottages range from 600 to 650 square feet and can comfortably accommodate six guests. Every cottage is surrounded by the tranquil natural surroundings of the resort’s premises close to the Hood Canal and come with spectacular views. Inside each cottage is a full kitchen, TV and DVD and luxury linens and comforters. Some of them are pet-friendly as well. The Alderbrook’s dining experience is all about appreciating the local cuisine of the Pacific Northwest. 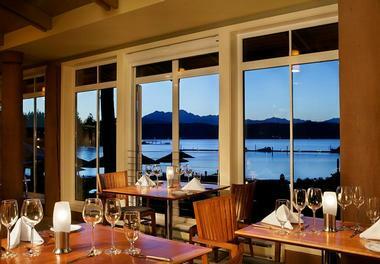 The hotel’s restaurant showcases seafood dishes straight from the Puget Sound as well as the Hood Canal. Guests will have the chance to savour creations like sweet oysters or crab cakes with jalapeno. All this is served with the best wines from the restaurant’s collection. Alderbrook offers different menus for different times of the day. So expect a variety of dishes available from breakfast to dinner, as well as a separate selection for dessert, wine and even kid’s meals. Alternatively, guests can watch the sunset by the bar as they enjoy their martini or other cocktail of choice. This is a great place to chill after a long day of fun and relaxation. Those looking for peace and tranquillity will find it in the Alderbrook Spa. This day spa in Washington State brings visitors to a place that’s surrounded by nature where the smell of cedar and evergreens fill the air and the soothing sound of water splashing on rocks can be heard. This full service spa offers all kinds of relaxing services, from the hotel’s Signature Massage to some aromatherapy. Guests can also relax in the spa’s steam room that’s infused with herbs. Here, guests benefit from a wrap of Marine Algae, Aloe, and Sea Brine – a combination that rejuvenates the body. There are also scalp massages, facials and a wide range of treatments that help refresh both the mind and body. Alderbrook is an ideal backdrop for a wedding. With the hotel’s special events staff ready, guests will have enough help to make sure that this special day turns out to be exactly how the couple dreamed it to be. Guests can opt for a formal ceremony set on the terrace or a more beach themed gathering by the seaside where barbecue and fresh local seafood can be served. The hotel staff will take care of most of the details. Wedding packages include all the tableware, linen, napkins, etc. The buffet, dance floor, as well as the bar will be taken care of as well. Guests simply have to tell them what they prefer and Alderbrook will make it happen. Alderbrook is also known for creating beautiful wedding cakes for the ceremonies that are held in the resort. The hotel’s pastry chef works closely with the couple to help them materialize the wedding cake of their dreams. Corporations and business groups have been known to choose Alderbrook Resort as their destination for corporate meetings, board meetings, conferences and team building activities. The resort is well prepared to accommodate groups of all sizes, may it be 12 or 200, thanks to its diverse and versatile meeting facilities, spanning up to 7,000 square feet in space. Every meeting held in this resort will come equipped with state of the art media technology to make sure that every presentation is at its best. Meanwhile, all participants will have access to high speed Internet access. Meanwhile, the venues such as the grand ballroom have spectacular views of the mountain, gardens and water surrounding the resort. 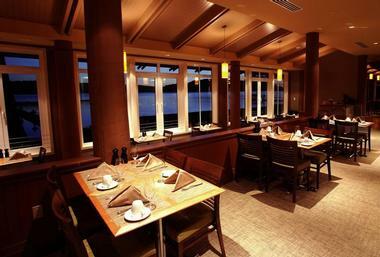 Those who arrange business meetings in Alderbrook will have access to expansive decks as well as waterfront venues. The selection for snacks and buffet will also be based on the host’s preferences. On top of that, participants of the business conference can be treated to cocktails under the night sky, chartered boat trips, kayaking, tours and even use of the PGA golf course. Indeed, every corporate meeting set in Alderbrook will be a mix of work and play. 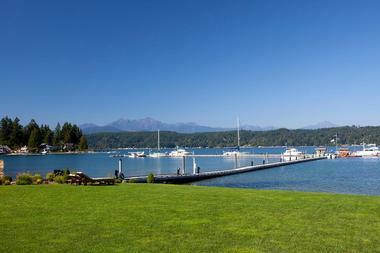 Since it’s between Seattle and Portland, Alderbrook Resort and Spa is an easy 2 hour drive away from either end. The property is also just a 45-minute drive from Olympia and a 1 hour and 20 minute drive from Port Angeles. In addition, Alderbrook Resort can be accessed via the Brementon ferry dock, which is only 30 to 40 minutes away. Those who prefer to travel by plane can take the Kenmore Air seaplane at the Tacoma Narrows Airport. Back to: Weekend Getaways from Seattle.